During the 19th century, Michigan’s forests yielded more money and created more millionaires than did all the gold mined during California’s Gold Rush. In turn, this wealth fueled the great financial and industrial rise of the state at the beginning of the 20th century. Before the lumber boom, most of Michigan was densely forested wilderness. Though Native Americans were the first to fell trees in Michigan, their modest needs had little impact upon the forests. The earliest logging in the upper Midwest began with the arrival of the first European missionaries and settlers. The French built missions, forts, and fur-trading posts out of pine. White pine, the most common tree, was preferred because it was easy to work and grew straight and tall. The largest specimens were 300 years old, 200 feet tall and up to 8 feet in diameter. Other abundant species were maple, elm, basswood and yellow pine. The French followed a tradition that had already proved disastrous to the forests of Europe—clear-cutting. When the British arrived, they cut many hardwoods to build their warships and merchant vessels. Initially the areas that were clear-cut were relatively small, but as the demand for lumber increased, so did the practice of clear-cutting. Commercial lumber production began in the 1830s, with the appearance of the first sawmills in the Saginaw area. Saginaw was the perfect place to begin, because it had more than three million acres of white pine forests and a network of over 1,500 miles of navigable rivers and streams. The Saginaw River had a total length of 864 miles. This resource was critical because the only method of transporting the logs from forest to sawmill was to float them down the rivers. Most of the lumber was cut during winter because the best way to transport the large logs to the rivers was by horse-drawn sleds. The logs were hauled to the banks of the frozen rivers where they were stacked and held until the spring thaw. After the spring thaw, they were floated down river to retention ponds, where they were sorted by company and then sent to their respective sawmills for cutting. A major advance was achieved with the introduction of the circular saw into mill operations around 1850. Logging expanded rapidly, and by the end of the Civil War, Michigan was the top lumber-producing state in the Union, producing more than 500 million board feet of lumber per year. 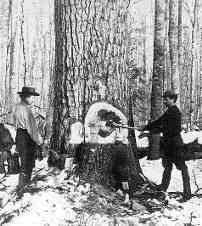 Most trees were felled by axes until the 1870s, when crosscut saws were improved so that they could be used to cut down standing timber. Two other innovations during the 1870s made logging a year-round affair. Big Wheels—logs suspended from chains attached to the axle connecting a set of enormous wheels and drawn by a team of horses—were invented as an alternative to sled transportation. In 1876, the first narrow gauge railroads were built to haul logs and they opened up immense new areas to logging that were previously inaccessible. 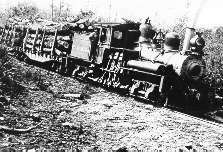 The state granted huge tracts of timberlands to logging companies to get them to improve roads and build new rail lines and by 1889, at least eighty-nine narrow gauge railroads were in operation. Logging companies often did not confine their cutting to the area they had purchased. There was the practice of "logging a round forty," which meant buying forty acres and then cutting the timber around it in all directions far beyond the boundaries of the area to which title had been secured. By 1900 most of the pine in the Lower Peninsula was gone. Pine logging in the Upper Peninsula began to assume greater importance in the 1880s, and the virgin stands lasted until about 1920. 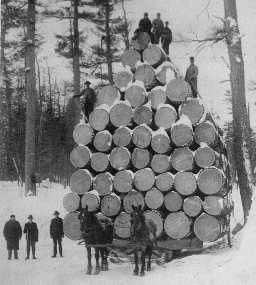 The peak of Michigan’s great timber harvest was reached in 1889-1890 when mills cut a total of 5.5 billion board feet of lumber, mostly pine. By the boom’s end, logging had stripped 19.5 million acres, none of which was replanted, leaving vast tracts of barren wasteland. The lumber barons attempted to unload the now worthless land by setting up demonstration farms, using large amounts of fertilizer to convince unsuspecting buyers that the soil was suitable for farming. Many small plots were sold to people who put up their life savings, only to find out after a couple of unproductive growing seasons that they had been cheated. Most of the barren land couldn’t be sold under any circumstances and it reverted to state ownership as the lumber barons abandoned it because they didn’t want to continue paying taxes on it. During the depression of the 1930s, one of the projects assigned to the Civilian Conservation Corps (CCC), made up of out-of-work young men, was to repair the damage done to the nation’s forests by clear-cutting. The CCC planted millions of seedlings and over time most of Michigan’s barren areas were reforested. However, some areas known as "stump prairies" still exist, even though it has been over a century since they were stripped of trees. Today, over half of Michigan’s land mass is covered by forests. Logging, which never disappeared altogether, continues, especially in the state’s northern counties, but it is being done very selectively, to preserve and protect the remaining old-growth forests. Tree farming began in 1941, and now accounts for the overwhelming majority of the nearly 675 million board-feet of lumber that Michigan produces annually. Michigan also produces over 15 million Christmas trees each year, representing approximately 15% of the nation’s supply.